For thousands of years, ginger has been used as a popular spice and herbal medicine. While the medicinal uses of ginger have traditionally served for treating a multitude of health conditions - including arthritis, colds, nausea, and migraines - it wasn't until recently that ginger properties have been studied and the many benefits of this herb have been validated by science. The following are uses of ginger that have been traced through history and corroborated by modern science. 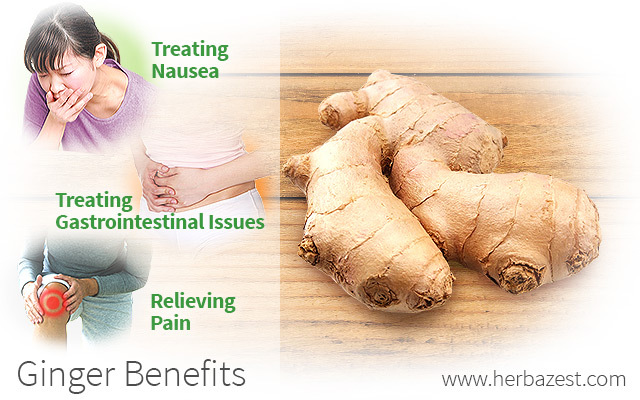 Ginger's benefits for relieving nausea and vomiting are perhaps the most well-known, documented, and supported. Ginger root is commonly recommended by healthcare professionals for treating seasickness and altitude sickness. In fact, it has even been shown to be more effective than both placebo and dimenhydrinate in easing motion sickness. Ginger has also been found effective in treating other sorts of nausea, such as morning sickness and chemotherapy-induced nausea. In fact, several studies have indicated that ginger is safe and effective in reducing nausea and vomiting for women in the early months of pregnancy. Furthermore, the gingerol in ginger has been reported to reduce cisplatin, thus helping to control nausea as a result of chemotherapy. The use of ginger for upset stomach has been popular for centuries. Its effectiveness is due to its metabolites, which tend to accumulate in the gastrointestinal tract, thus making fresh or dried ginger very beneficial for treating stomachaches and dyspepsia. In addition, ginger has anti-ulcer effects, as well as antispasmodic and antiemetic properties that help to calm upset stomachs. Current science suggests that the efficacy of ginger for inflammation comes from its ability to modulate calcium levels. This makes ginger a great home remedy for treating headaches and migraines. Additionally, ginger has been shown to be effective in relieving the symptoms of arthritis. The results of a study published in Arthritis and Rheumatism (2001), focused on osteoarthritis of the knee, suggest that ginger extract may be significantly helpful for relieving pain and inflammation. Preliminary research has suggested that ginger may be effective in lowering cholesterol and blood pressure. In that way, ginger may be a good preventative against heart disease and diabetes. Moreover, ginger has been found to decrease or suppress oxidative stress, which can be defined as an imbalance in the production of free radicals and the body's antioxidant defenses. Oxidative stress has been associated with many chronic diseases, including diabetes and cancer. Most recently, there has been much interest in the possible applications of ginger for weight loss. The gingerol in ginger has been shown to aid in burning those extra calories accumulated as fat, probably due to the combination of its anti-inflammatory and antioxidant abilities. Lastly, in many cultures, ginger is viewed as an aphrodisiac. However, its actions as a sexual stimulant have not been confirmed by science. Nevertheless, ginger's use as an aphrodisiac has long been reported by some cultures and even recorded in literature. Despite the fact that ginger has been used medicinally for thousands of years, only in recent years has the growing interest in natural remedies and alternative medicine led researchers to further investigate ginger effects as a medicinal and therapeutic herb. For all that has been discovered and confirmed about the effects of ginger, there is still much to learn.